Hallelujah, we finally got some rain! Not a lot, I'm guessing around 3/4 inch, but anything is welcome at this point. We also got a brief sprinkle this afternoon. This is the shrub rose Gruss An Aachen. 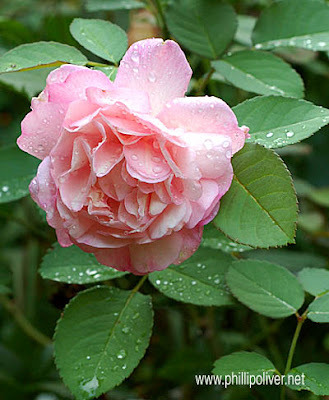 Considered to be the first floribunda rose, it is a low growing (under 3 feet) upright shrub which is covered with plump, pale pink flowers that fade to creamy white with age. The name means "greetings to Aachen" which was the city where Emperor Charlemagne made his home and also the hometown of the rose breeder. Beautiful photo! Thanks for the history too :) I'm so glad we finally got a little rain! You are showing off those raindrops with pride! I know you were so happy to get some sky water. We went thru the same thing last year. It would even rain in sections of our neighborhood and miss our street. The ground was so hard I actually dug holes for plants with a pick axe at some points. Lovely rose and it's wonderful that you got rain! Now your beautiful garden will continue to bloom! That is a lovely photo. I have one planted with some May Night salvia--very pretty combination. Mine stays short enough to fit very well near the front of the border. I live in Tupelo, MS and have been reading your blog for a while. You're fortunate that you got the rain. We got a very short shower, immeasurable, and all the while the sun was shining! I enjoy seeing the beautiful pictures and your lovely garden! Thanks for sharing it with us. Well, the rain wasn't that much and I hope we get more soon - ditto for all you other rain-starved gardeners as well. Thanks for dropping by Judy! I love Gruss An Achen, although my plant is being crowded and shaded out to the point that it's not looking great these days (that describes lots of the things in my garden!). Never knew "Gruss" meant "greetings"; I had years of Latin, and I've done a lot of singing in German, but rarely know what I'm saying when I do. Your whimsey is a whole lot classier than mine (as is your whole garden, by the looks of things!). My latest project is mounting a staghorn fern on a set of (broken - I have to fix them first)moose antlers I found by the curb one garbage day a few weeks back. That's where lots of my garden art comes from; I think it's genetic.